Preheat grill to medium/hot. Rub bell pepper with oil. Grill until blackened. Place in bowl. Cover with plastic wrap. Set aside to cool. Season steak with salt and pepper. Grill to medium rare. Let rest 10 minutes. Cut into strips. Peel and seed cooled bell pepper. Slice into thin strips. Whisk ½ cup olive oil, balsamic vinegar, garlic, and ¼ teaspoon salt in small bowl until blended. Set aside. 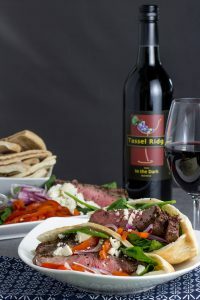 Arrange steak, bell peppers, spinach, feta, and onion on platter. Serve with pita bread and balsamic vinaigrette. Serves 4.